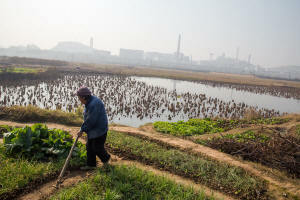 CHENJIAWAN, China — The farm-to-table process in China starts in villages like this one in the agricultural heartland. Food from the fields of Ge Songqing and her neighbors ends up in their kitchens or in the local market, and from there goes to other provinces. The foods are Chinese staples: rice, cabbage, carrots, turnips and sweet potatoes.